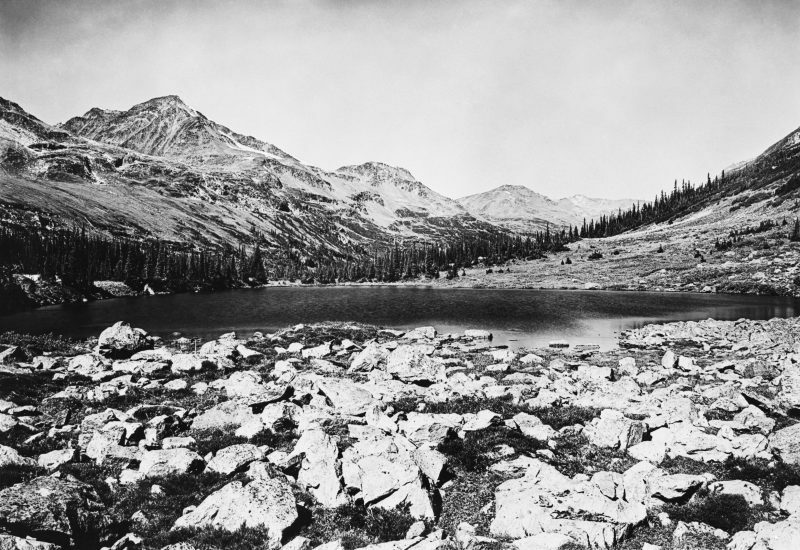 This image of the Committee’s Punch Bowl Lakes, in Athabasca Pass, is image number na-3490-26 in Glenbow Archives, and I have used it with their permission. From the Rearguard Falls [on the headwaters of the Fraser River, in British Columbia] the men climbed the sparsely wooded ridges to the summit of the [Yellowhead] pass and followed the Miette River through clear pastureland to Jasper’s House, on the Snake Indian River. It was early October, and the express boats had not yet come from Edmonton House. Because the post was already short of provisions, the New Caledonia men [under Anderson] set up camp at the lake southwest of Jasper’s House and fished for their suppers. The New Caledonia men made it home months later. They were stopped by the deep snow and frozen river, and returned, on foot, to Jasper’s House. Anderson and McKinlay finally made it to Fort St. James by dog sled. I am not going to tell the entire story here, but they were very lucky to have survived. If you want it the story you can read it in my book, The Pathfinder. But I did find it interesting that James Douglas, as he crossed the more southerly Athabasca Pass, also ran into a major snowstorm. There were several locations for Jasper’s House, and it was not always called Jasper’s House,. In his journal James Douglas called it Klyne’s House, because at the time he was there, Michael Klyne (a Dutchman, interestingly) was in charge of the post. [October] Sat. 10. Left the fort [Jasper’s House] and encamped at the Little Rocher, 6 miles from the fort. Sun 11. Fine weather. Encamped at Henry House. Distance 20 miles; time 5 hours. The Little Rocher was probably what is later called in various journals, “Rocher du Bon Homme.” Alexander Caulfield Anderson noted that both Rocher du Bon Homme, and Riviere Bon Homme, were named for Bonhomme Miette, who once worked at Jasper’s House. There is also a mountain named for Miette, though historians argue it is actually named for an earlier employee called Millette. We can argue these names forever, I think. If anyone actually knows the truth of Miette/Millette, I would love to hear it. Anyway, at this time Miette’s Rock was immediately across the river from Jasper’s House, so no one had to travel over its slippery nose, as earlier NWC and HBC men were forced to do. The Athabasca River curled around the point of Miette’s Rock, which was called Disaster Point because of the many horses that slid off the rock into the river as they were scrambling over the steep trail. Though Miette’s Mountain still stands in Jasper Valley, its slippery, sloping nose no longer exists. It was blasted away to make room for the railway. Henry’s House, mentioned in James Douglas’s journal, was no longer a post, but its old location was still recognized by the HBC men. In 1827, George McDougall’s men rested for a day or two at Henry’s House, so it seems there were still buildings there. Henry’s House was across the Athabasca River from the place the York Factory Express men called Larocque’s Prairie, where in most years the Columbia and New Caledonia men separated their packs and began their different journeys via the two passes into what is now British Columbia. In 1827, Edward Ermatinger’s incoming express camped at Larocque’s Prairie, as did Aemilius Simpson’s incoming express in 1826. In fact it is Aemilius Simpson who tells us that Henry’s Plain [or House] was almost directly across the Athabasca River from Larocque’s Prairie. The interesting thing about James Douglas’s journal is that he traveled through Henry’s House, rather than Larocque Prairie, which almost all other expresses passed through. Douglas’s party was not traveling with the New Caledonia brigades this year, and so there must have been some advantage to using this different route to Athabasca Pass. Of course, it also all depended on which route the Guide preferred. He, and not James Douglas, was actually in charge of the Express. Mon. 12. Weather variable. Rain and fair weather by turns. Stopped at Prairie a la vache, and encamped on the holey river. Distance 18 miles. “Prairie a la Vache” was Campement des Vache, now known as Buffalo Prairie. It was about halfway between the junction of the Miette River, and the mouth of Whirlpool River to the south. It is important to note that these men are traveling from north to south as they make their way through the Jasper Valley toward Athabasca Pass and Boat Encampment!. The Holey River was the Whirlpool River at its junction with the Athabasca. These men would follow the Whirlpool River to Athabasca Pass, leaving the Athabasca River behind them. If you are wondering about the name, “Holey,” it is a French word written as it sounds in English, and means exactly what it says. There was a “hole” of deep water at the traverse of the Whirlpool River, that often caused problems for the York Factory Express men. Tues. 13. Raining in the morning, and in the evening heavy snow which rendered this day particularly disagreeable; drenched to the skin by the rain in the early part of the day. We were by no means prepared for the transition which followed to heavy snow. The encampment and a good fire were highly relished by all. Stopped at Commencement of Moose encampment, & encamped two miles below Grand Batture. Distance 22 miles. So not an easy journey, and these burnt trees were mentioned year after year. James Douglas’s journal mentioned above, that they had breakfast (their mid-day meal) at Moose Encampment, or and camped before they reached the Grand Batture. Moose Encampment was known in the various journals as Campement d’Orignal, Moose Encampment, or Moose Deer Encampment. It was situated on the banks of the river, deep in the narrow Whirlpool River valley. Aemilius Simpson says it was on “a flat or Batture through which the River had its course, bounded by immense Mountains whose summit appear almost vertical to us.” The Grande Batture was 24 miles south of Campement d’Orignal [Moose Encampment], and is now known as the Scott Gravel Flats. Wedy 14. Stopped at Gun encampment and slept before commencing the Big Hill. Time 8 hours. Distance 18 miles. Rain & Snow. Gun Encampment is today’s Kane Meadow, a few miles north of Athabasca Pass itself. Some of the York Factory Express called this camp Campement du Fusil. South of Gun Encampment was the Pass itself, and the Committee’s Punch Bowl — a place that almost no one mentions. And yet, important ceremonies took place here on a regular basis. Everyone must have experienced them, but no one wrote of them. We can’t say it much better than that! However, there is another comment that should be placed here. The scenery of this place, at this time, was so splendid, or fearsome, that an early voyageur looked around him and cried out, “God Almighty never made such a place!” It is no longer so splendid, and we cannot see what this voyageur saw. The ice, that made the valley so narrow that the men’s shoulders brushed both sides of the Pass as they made their way through it, has melted away. We can never see what they saw. There were some landmarks between the Committee’s Punch Bowl and the Big Hill, which are mentioned in some journals, and not mentioned in others. Once they were through the pass they entered the valley of John Work’s “foul or faint hearted river,” or Pacific Creek. Because the snow lay so long in this valley, the ground was always soggy and offered few dry campsites. Thomas Lowe noted that on one journey his party camped in “the swamp.” The places they called “Mr. Rae’s Encampment,” and “Mr. Roussain’s Encampment,” may well have been in the valley of Pacific Creek, or on the top of the saddle that separated this valley from the Grande Cote [Big Hill] itself. Athabasca Pass at the Committee’s Punch Bowl Lakes was nearly 5,700 feet above sea level. The sloping valley of Pacific Creek took the men down to a place where they then climbed again, to the top of the saddle that separated the Pacific Creek valley from the beginning of the Grande Cote. It was apparently a 750 foot climb from Pacific Creek to the top of the saddle, and Athabasca Pass loomed some 700 feet above the height of the saddle. So, there are three big hills here — not just one: amazingly all these hills were traveled on horseback, with pack horses! Thurs. 15. Stopped at foot of the Hill. Encamped after passing the point of woods. Distance 17 miles. Rain and snow. Friday 16. Arrived at the Boat Encampment in the afternoon. Found here 3 men from [Fort] Colvile who are to assist us down with the boats. These men arrived here on the 1st [October] and after waiting a few days without seeing us, Lamotte very properly dispatched 4 of them to Colvile remaining there himself with two others. Fair weather. Distance 19 miles. Total distance [from Jasper’s House] 120 miles. So James Douglas and his Columbia party have reached Boat Encampment, where the Fort Colvile men have been waiting for fifteen days. The next section of their journey would place them in Columbia boats, which differed in many ways from the York Boats used on the North Saskatchewan River. But I will leave those descriptions until the next post, which will take us down the Columbia River, through modern-day British Columbia, to Fort Colvile.